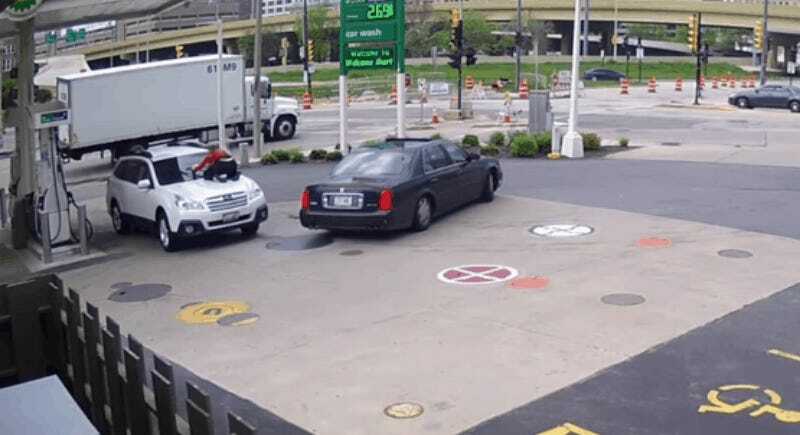 On Tuesday, 27-year-old Melissa Smith was filling up at a gas station in Milwaukee when a man jumped into the driver’s seat of her car, trying to steal it. Smith immediately jumped on the hood, and held tight long enough that the thief eventually ran off. The media are hailing her as a hero. But, in fact, she’s an idiot. No car is worth your life. Milwaukee, like every single city in the United States, is filled with people who have guns. Thankfully, Smith wasn’t hurt. But it could have been so much worse. The attempted carjacking happened in the middle of the afternoon at 2pm. 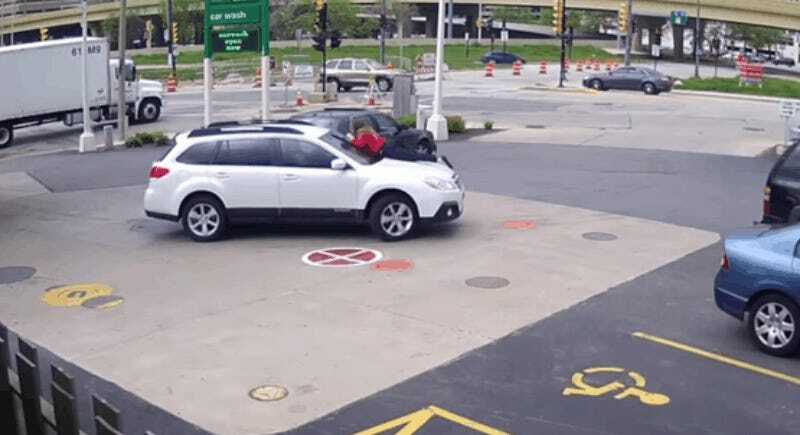 Smith was just finishing up filling her tank when the man quickly darted into the driver’s seat. She jumped onto the hood and the man started driving forward to try and push her off. After a brief pause he revved forward a second time as she hangs on for dear life. The attempted thief then jumps out of the car without putting it in park, sending the car careening into traffic with Smith still on the hood. She jumps off, and desperately tries to get inside the driver’s side door. She finally manages to get inside and stop the car before it rams other traffic in the street. A Good Samaritan who witnessed the whole thing can do little more than watch and run after Smith’s car as she rolls into traffic. The carjacker’s getaway car peels out, managing to get away with her purse. Smith is lucky that she wasn’t injured, let alone killed either with the car itself or any other kind of weapon. If someone jumps inside your car and tries to take it, you have a lot of different options. But jumping on the hood is one of the dumbest. 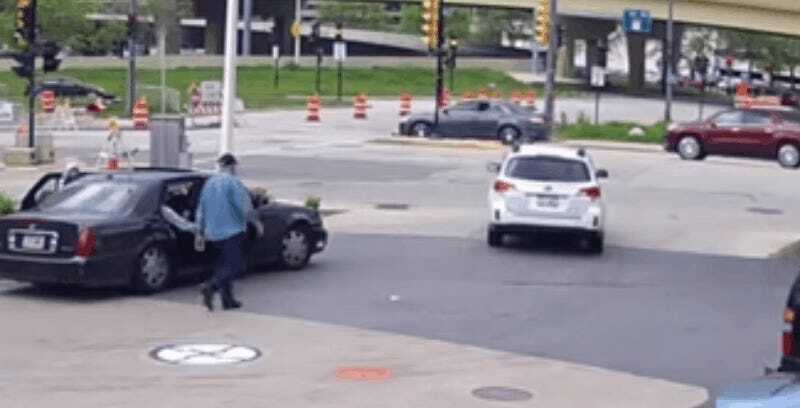 Police Chief Edward Flynn told the Milwaukee Journal Sentinel that he wouldn’t recommend other people try the same thing if they’re ever in a carjacking situation. “Certainly her life wasn’t worth that car and that easily could have had a tragic outcome,” Flynn said. If someone tries to steal your car, don’t jump on the hood. A 64-year-old man was killed with a shotgun in Milwaukee this past March during an attempted carjacking. This has been your daily lesson in not being an idiot over material things.